"This reminds me of figgy pudding. It can be made year round! These will be sticky! They may need to be rolled in confectioners' sugar again before presentation because the moisture of the cookies absorbs it!" Crumble fig bars into a bowl. Stir walnuts, orange juice concentrate, cinnamon, allspice, and cloves with the fig bars until well incorporated. 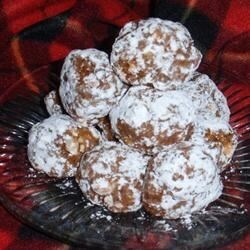 Shape mixture into balls and roll in confectioners' sugar to coat.